The Week of the Young Child is an annual celebration first established by the National Association for the Education of Young Children (NAEYC). It publicly focuses on the needs of young children and their families, while recognizing the early childhood programs and services that meet those needs. The Marianna Kistler Beach Museum of Art, the Kansas Association for the Education of Young Children, USD 383 Early Learning Centers, Kansas Child Care Training Opportunities and K-State Center for Child Development have partnered to celebrate the Week of the Young Child in our community. Visit stations around the museum with featured works from Picturing America produced by the National Endowment for the Humanities. Classroom staff took a day and had the families come in and spend time with their child/ren putting their creative minds to work on the theme of water to go with the exhibition “Water Stories.” This is one way USD 383 Early Learning Centers staff and parents share the world of art with their children and are able to build on their school readiness skills and parents are able to be a part of the process. 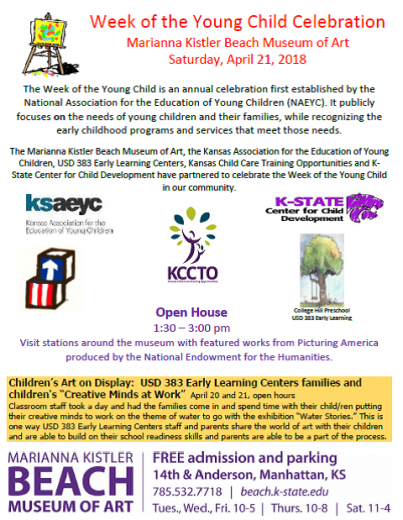 The Marianna Kistler Beach Museum of Art furthers the teaching, research, and service missions of Kansas State University by collecting, studying, caring for, and presenting the visual art of Kansas and the region.